Then-Colorado Gov. John Hickenlooper speaks during the panel Economic Development at the National Governor Association winter meeting Feb. 25, 2018, in Washington. WASHINGTON -- John Hickenlooper continued to drop hints that he might run for president during a public policy presentation Thursday in the nation's capital. “No, we haven’t made a decision,” the former Colorado governor told a moderator during a discussion on how to formulate government policies at the Brookings Institution, a social science research foundation. As he has said repeatedly in recent months, Hickenlooper said he has been discussing a presidential run with his wife and children while traveling around the country. The travels included a trip to Iowa last weekend, where Democrats will hold the first-in-the-nation presidential caucus in just over a year. In addition to explaining his policy decisions as Denver’s mayor and Colorado’s governor, Hickenlooper criticized the Trump administration while advocating business development and environmentalism. “I think the dysfunction in Washington has become a point of frustration for almost everyone,” he said. He called some statements from the Trump administration “marginalized” as to their truthfulness. “When people don’t trust facts, when there is uncertainty about what is truth, is when totalitarian regimes rise up,” Hickenlooper said. He recommended the kind of bipartisan strategy for resolving problems that many saw as typical of his terms as mayor and governor. “Somehow our leadership needs to come together to build those relationships,” Hickenlooper said. > RELATED: WATCH: How is Hickenlooper's not-quite-yet campaign from president different from other candidates? He would be joining a crowded field of Democrats who see an opportunity to win the presidency in 2020 as they exploit the unpopularity of President Donald Trump. Nine Democrats have announced their candidacy so far. Nearly 20 -- including Hickenlooper -- acknowledge they are considering presidential campaigns. In 2016, only five Democrats were considered serious candidates for president. During the forum in Washington Thursday, Hickenlooper mentioned his program to reduce regulatory obstacles to business development as one of the successes of his governorship. Before he became governor, about 24,000 rules and regulations controlled how Colorado businesses operated, he said. Hickenlooper said he reduced the number of regulations by about 11,000. The regulations sometimes create “burden after burden, hill after hill” for businesses, both in Colorado and nationwide, he said. “Right now we’re seeing some of the lowest level of start-up businesses in the country that we’ve seen in 50 years,” Hickenlooper said. He also touted his record of reducing air pollution from oil and gas drilling as an example of helping both business and the environment at the same time. Oil and gas wells often produce methane, a powerful and toxic greenhouse gas. 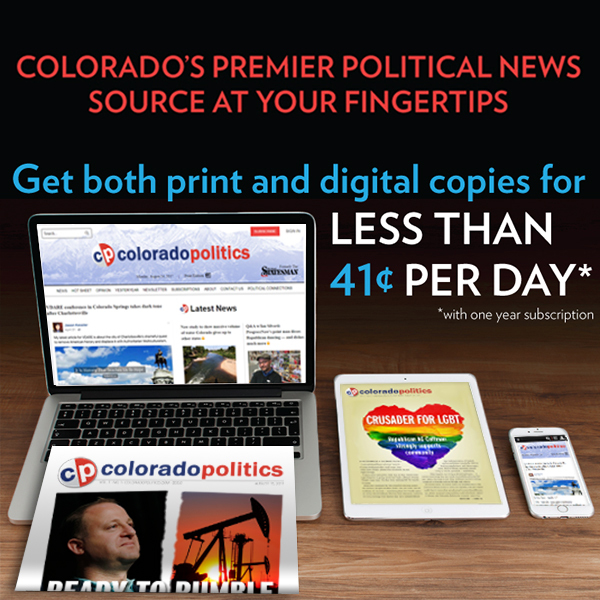 Hickenlooper agreed the companies should be able to use fracking to extract oil and gas. Fracking refers to injecting high-pressure liquids into wells to fracture underground rock, thereby making oil and gas flow more freely as it is pumped out. But he also agreed with environmentalists that emissions from the wells should be reduced. After sometimes tense negotiations between the two sides, oil and gas companies said they would spend $60 million to check all drilling sites for methane and other emissions. “It was the equivalent of taking 325,000 automobiles off our roads,” Hickenlooper said. The former governor also described his turnaround on marijuana legalization. “I was famously against it,” Hickenlooper said. He was concerned about potential mistakes in building a regulatory framework, conflicts with federal law that bans marijuana sales and harmful health consequences. “Most importantly, we were concerned about a spike in teenage consumption,” he said. Some studies showed the active ingredient THC in marijuana could permanently impair the long-term memory of young people who consume it. However, he changed his mind after Colorado voters decided to legalize marijuana sales to consumers. “We have not seen a spike in teenaged consumption,” he said.